Over spending is just something that I find hard to let go. Though I never miss a month without a budget... I find it really hard to commit to my allocation. I will always have excuses and reasons why I deserve a treat, a meal or a splurge on a particular day. Even though deep inside I know that I should be saving money instead of wasting it for no important reason and put my future first, spending just feels so good. I love grocery shopping, dining alone and over thinking on a specialty cafe until it's too late for me to realize that my saving goals are slowly deteriorating. If you've been a SavingsPinay reader for quiet some time you know how many posts have I already published concerning making a spending plan. The Notebook System and the Envelope System were just two classic budget technique everyone must be knowledgeable of. I even came up with the Rule of 50-20-30 Budget Template and My Current Spending Plan. All of the above plans works perfectly for every income BUT, it is the lifestyle that will be the biggest metric for success. If only I stop on impulse buying and making dramatic excuses on why I need another mascara or plate of Greek salad, I know I have more savings that I currently own. I am not perfect after all. And all I wish and pray is that God will bless me the determination to stop overspending and start leveling up my savings for the better. So here are 7 Awesome Tips that I found on the web That Will Help You Stop Wasting Your Money! In my Smart Shopper post I mentioned those who pay with cash rather than depend on credit cards are most likely to help you save. You are able to see as to how much is taken away from your kaban. All you to is to plan your purchase, allocate money in cash for your spending and leave your credit cards at home so that you have no other choice but to buy with cash. Since I am a self-proclaimed list maker, I realize that writing down your expenses is very helpful. Make a list of before you go shopping and doing your grocery so that you have a basis on what you will purchase. You can use your Notepad in smartphone or a normal notebook for this trick. Another tip that I learned from top blogger, Mr. Leo of ZenHabits is that whenever you are tempted to make a big purchase write it down in a notebook. Now if after 30days you still have the same cravings for the said item then buy it. The waiting period will give you enough clarity and time to save for the amount of the item you will buy. I am not the best cook ever but watching quick breakfast and lunch ideas in Youtube led me to appreciate doing your own food at work or in school. You can shop once a week for the ingredients and wake up an hour earlier to prepare your breakfast and lunch. Make sure you also have some snacks on the side so that you won't spend unnecessary money on food outside. I am very guilty in committing this financial crime. I will get hungry during the commute time that I will choose to have a quick snack in the mall before heading home. This led me to spend 100-200pesos just for a snack!!! I also feel guilty because I there are times when I don't appreciate the meal prepared at home since I am already full. Have the courage to set a saving challenge for yourself. You can go as simple as saving 1000pesos for the coming work week or applying for your first investment before the month ends. Encourage yourself to step up in your financial goals by proving that you can be financially independent. One great saving tip that you can do is to have a saving goal every month. This means that before the new year comes you'll have 12 big guilt-free purchases done because you manage to save your money. A running shoes on May, designer bag on June or a 1500pesos makeup splurge on July. Just set yourself on the goal and you'll see how amazing it would be. Never delay acting for your financial freedom as early as now for the earlier you take saving money serious... The better chance that you will be successful in life. Hope you love this post. 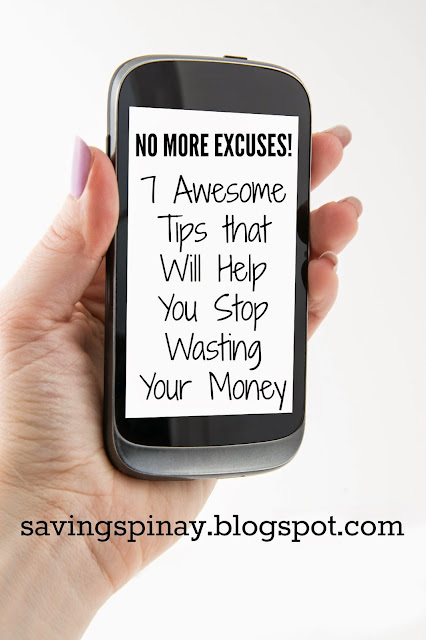 Do you have other Tips in how to Stop Wasting Your Money?! The Rule of 72: The Classic Computation every Investor Must Know - New!